Let’s talk about what you have in mind: we’ll find the ideal pumice grade for your process need or product. Pumice is created from rapidly cooling viscous molten rock (rhyolitic magma) trapping gas bubbles and resulting in a foamy, whipped glass. 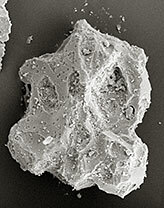 This micro-photograph shows pumice crushed down to about standard grade 2 in size and magnified 250 times. Even when finely processed, pumice retains its friable structure and abrasive edges. 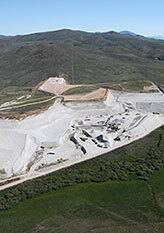 Aerial view of the Hess Pumice mine in Idaho, USA. The word pumice is derived from the Latin word pumex, meaning foam. Pumice is a textural rock formed from volcanic eruptions. Deep underground, molten rock incorporates water and other gases, and when the magma erupts from a vent, the gases flash off, leaving behind a frothy, vesicle-riven structure that quickly cools, solidifying the foamy structure. The magma has now transformed into an amorphous aluminum silicate, or pumice. Pumice is found in pyroclastic flows or accumulated into drifts, piles and banks (deposits, in mining terms) by wind or wave action. If the newly formed pumice falls on or erupts beneath a body of water, wave action will deposit the floating mass on or near the shore as it saturates and sinks. This centuries-long process results in a very pure pumice—the heavy minerals dropping to the sea or lake floor, while the pure pumice is washed to the shoreline. This is the case with the pumice deposit that is sourced by Hess Pumice in Southeast Idaho. The Hess pumice deposit sits on the shore of an ancient inland lake known as Lake Bonneville. The current Great Salt Lake is all that is left of this once-vast freshwater lake. The vent that supplied the pumice in the Hess deposit is only about a mile away. Pumice is a very plentiful amorphous rock found all over the planet, although not all pumice is ideal for refining and use in industry. We know the Greeks and the Romans relied extensively on the wonders of pumice when they created the concrete mixtures which were used to build their empires…roads, aqueducts, temples, cisterns and other structures. The majority of the roman pumice came from Pozzuoli, a city near Rome, from which pozzolan gets its name. Interestingly, pumice is not a localized product, meaning that the unique characteristics of a particular pumice deposit—it’s MOHS scale hardness, the purity level, whiteness, and the ability of the company that mines and refines it to meet various industry specs—determines market demand from any corner of the world. For example, the pumice from the large commercial deposit in southeast Idaho is refined and shipped to 27 countries on every continent on the globe except Antarctica. As a matter of fact, over 70 percent of Hess pumice products are shipped into Asia and Europe because the pumice meets strict criteria for purity, color, and performance that local supplies cannot. The various commercial pumice producers use their own variants on the process, but generally, a pumice deposit is surface-mined, meaning the overburden of soil covering the pumice is pushed aside and stockpiled for later reclamation. The pumice is then scraped up using bulldozers and pushed to the crusher for preliminary processing and stockpiling for loading and hauling to the plant for processing. When weather permits, the mining goes on year-round, otherwise, sufficient quantities are stockpiled for refining during winter months. Pumice is then typically dried to the necessary moisture content ideal for refining before it is lifted to the top of the plant structure and via gravity, begins its journey down through the crushers, screens, and separators until it is finally bagged in sacks or bulk bags or loaded in bulk container cars or blown into pneumatic transport trailers or pneumatic rail cars. The actual shipping method depends on the end user. For example, a dentist buys his pumice in a small 2-ounce jar. A manufacturer of hand soap or a computer circuit board manufacturer will receive pumice shipments as shrink-wrapped pallets of 44 lb. bags (20 KG) that arrive via truck or ocean-going container. A public works department using pumice for water filtration may take delivery of their pumice in bulk rail cars. A concrete batch plant will accept a load of pumice (used as a natural pozzolan) in a pneumatic truck. The bottom line is that a company with a pumice deposit in demand world-wide, such as Hess Pumice, necessarily develops the expertise and ability to package pumice however the customer needs it packaged and to ship that pumice efficiently where it’s needed, anywhere in the world. Does pumice float? Indeed it does…some of it. Not all pumice is created equally. Some is more dense in make-up, with fewer vesicles of trapped air in the matrix. So, the lighter or more “fluffy” a deposit of pumice, the more likely a pumice stone is to float on water…at least until the water finally infiltrates enough of the stone’s porosity and sinks it. In 2012, NASA satellites photographed a huge raft of pumice in the Pacific Ocean resulting from the eruption of an underwater volcano known as the Havre Seamount. A New Zealand Navel vessel sent to investigate reported finding a raft of pumice up to two feet thick and some 300 x 30 nautical miles in size. Dispersed by wind and current, the pumice can stay afloat for many months. Pumice is found in many consumer products and is used in industry for a variety of filler, abrasive, filtration, and concrete applications. 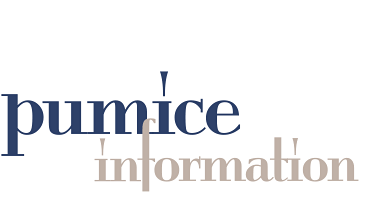 Read an extensive breakdown of what pumice is used for on the Pumice Uses page. Pumice is an ideal aggregate for lightweight concrete building blocks. Pumice is also used as an abrasive, especially in milder applications such as television glass, computer circuit boards, softening and aging textiles (like denim), exfoliating skin. Pumice is extremely ‘friable,’ which means that even when crushed to a very fine power, it does not lose its sharp edges and ability to abrade and polish. Pumice’s vesicular makeup (matrix of air-filled chambers) makes it ideal for blast mitigation, as the pourous chambers will absorb blast energy as the vesicles are crushed sequentially. When pumice is used in bomb encasements, it can help alleviate the damage from accidental blasts. Pumice serves as a filtration media in large culinary water systems around the world. Pumice aggregate and pumice pozzolan are used in concrete applications world-wide. Pumice is the critical lightweight aggregate that underpins the run-away success of strong, lightweight manufactured stone veneer and other lightweight concrete products. Pumice aggregate increases the concrete's R-value by a factor of 4, giving pumice concrete construction a huge advantage in energy savings. The horticulture industry uses pumice to aerate soils and add to a dense soil’s ability to retain moisture. Pumice can also serve as the growing medium for plants in non-soil, hydroponic applications. Pumice is an excellent filler. It is non-crystalline by nature, non-toxic and non-hazardous. The paint industry, for example, relies on ultra fine pumice as a functional filler that gives paint a lower density as well as burnish and stain resistance. Coarser grades of pumice provide excellent anti-skid properties. The rubber and plastics industry also uses pumice as a functional filler. The construction industry uses pumice pozzolan enhanced concrete to add durability, longevity and strength to critical concrete applications—roads, bridges, precast concrete products, GFRCs, well cements, cementitious grouts, lightweight tilt-up panels, and decorative concrete. The chemical properties of pumice will vary from deposit to deposit, but essentially, pumice is primarily Silicon Dioxide (Amorphous Aluminum Silicate), some Aluminum Oxide, and trace amounts of other oxides. If you want to see an analysis of Hess Pumice, in particular, go to this webpage. And if you’d like a sample of Hess Pumice to analyze in your own lab, we’ll be glad to send you some. The “green” tag is generally given to products and processes that are not energy intensive or do no harm to the environment. That is, of course, a very basic definition...the term “green” is now a widely applied marketing term for just about anything. Pumice pozzolan is green by the simple fact that the most crucial step in the manufacturing process—the superheating that gives pumice is amazingly versatile properties—has already been taken care of by Mother Nature. Pumice is “naturally calcined,” which simply means that the pumice has already had it’s time in the furnace: a volcanic furnace. Unlike metalolin, silica fume, and fly ash, pumice does not need to be heated or calcined to change its chemical makeup to make it useful as a pozzolan. Contrast, for example, Portland Cement—the key ingredient for concrete. Portland Cement is manufactured by mining limestone, crushing it, and then (critical!) heating it in a furnace to change its physical properites. The resulting “clinkers” are then ground down to about -325 mesh. The result is ever-so useful cement powder. So, in terms of a carbon footprint—the energy needed to produce the final useful product—Portland Cement, is a major concern of industry and governments alike. Cement production constitutes a major portion of all major green house gases production. Fortunately, when it comes to concrete, pumice makes an incredibly useful pozzolan (the Roman word for pumice was “pozzolana”), and pozzolans do wonderful things to enhance and improve standard concretes. So, replacing part of the Portland Cement power with pumice powder (pozzolan), significantly moves the green needle on the concrete while imparting incredible high-performance characteristics as well. A bonus on top of a bonus. The process: pumice is mined from an ancient volcanic deposit, crushed and transported to the refining plant, where it is again crushed and separated into the various particles sizes utilized by industry…from half-inch aggregate all the way down to an ultra-fine grind of 3-microns—the equivalent of smoke. The refining process needs little energy and uses no fresh water. Talk to an Expert—Let’s talk about what you have in mind: we’ll find the ideal pumice grade for your process need or product.